Used Alfa Romeo Spider Review - 1996-2004 Reliability, Common Problems | What Car? What should I look for in a used Alfa Romeo Spider sports? A full service history is a must because neglect can cause oil to clog the 2.0-litre engine. Cambelt changes are needed every 36,000 miles or three years, although Alfa Romeo says it's only necessary every 72,000 miles/six years. If neglected, the belt can slip or snap. Rear suspension bushes wear and, if the resultant clonking is ignored, this can damage the linkage and arms, tripling repair costs. Look out for faulty or damaged hoods: the electric opening system must be A1. Also check the alloy wheels, as they can become porous, so that tyres lose pressure. And, if you'r elooking at a 1990s' car, check it has a red-topped master key in addition to the blue-topped one. Without it, duplicates cannot be made, and replacing it is expensive. Rust affects the rear deck where metal joins glass, and also under the rear arches. If it is visible, it is serious. Repairs are possible, but will be expensive. Torn or frayed seats will cost more than you'd guess to fix. What are the most common problems with a used Alfa Romeo Spider sports? 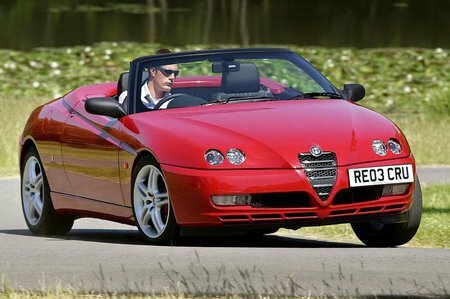 Is a used Alfa Romeo Spider sports reliable?